Speaking of "The Big Short" and my review of it, here's some of the amazing story of Jon Corzine-- former Democratic Senator and Governor from New Jersey-- and the fall of his investment firm, MF Global. MF Global...lobbied against a Commodity Futures Trading Commission proposal that would have placed tighter restrictions on how futures-trading firms can invest cash sitting in customer trading accounts. MF Global Chief Executive Jon Corzine in July participated in a conference call with CFTC officials and strongly opposed the restrictions, saying they would hurt business. This WSJ editorial notes the absence of (an effective) regulatory presence, even after the subprime fiasco. If reports of missing funds are true, it's a significant embarrassment for the firm's regulators at the Commodity Futures Trading Commission. CFTC Chairman Gary Gensler has been leading the Beltway chorus for years in reciting the (false) story that the absence of regulation allowed AIG and its credit-default swaps to wreak havoc in 2008. It is also no small irony that MF Global was among the cheerleaders for Mr. Gensler's plans for new clearing arrangements under Dodd-Frank. Maybe if the regulators hadn't been so busy writing new rules, they would have checked if MF Global was following the old ones. It was always fanciful to believe that the regulators who failed to prevent the last financial meltdown would somehow prevent the next one. The surprise is that this mirage of regulatory competence has been exposed so quickly. Some takes on Corzine have been very rough. (See: Jon Stewart with a funny segment with the usual colorful language.) Others, like this from the AP's Angela Delli Santi, have been quite (overly?) respectful. This WSJ editorial notes that at least he lost, mostly, his own money (vs. taxpayers'). Finally, this Holman Jenkins WSJ op-ed revisits the Corzine political legacy in light of recent events. A friend loaned me Michael Lewis' The Big Short. Really good stuff-- as usual from (what I've read of) Lewis. As a popularized of history, his work is readable and seems accurate. He does a nice job painting portraits of characters and laying out institutional and historical detail. (The one big disappointment-- an omission-- is that Lewis did not address the role of "mark-to-market" regulations as a catalyst for the crash, or at least its timing.) Overall: an easy, good read. The primary topics of the book are the burgeoning "subprime" home mortgage market (from $130B in 2000 to $625B in 2005), the subsequent market for investments connected to those mortgages (from $55B to $507B), and the failure of the market and govt regulating authorities. 1.) A "subprime" mortgage is not inherently troubling, as long as the underlying (greater) risks are correlated with higher rates of return. If those risks are not easily understood, then the market will struggle. If those risks are subsidized, then the govt is causing inefficiency and other troubles within markets. Both occurred here. 2.) Likewise, a subsequent market for mortgage-related investments is not inherently troubling, as long as the nature of the investments is understood and their risk is not subsidized. We see such financial markets arise to act as a form of insurance-- a "hedge" against various future outcomes. The problem in this market is that the investments were very complex AND the ratings agencies (in whom investors placed their faith) were a combination of inept and greedy. (Lewis noted that Warren Buffett had/has a 20% ownership stake in Moody's!) Moreover, the govt regulation of those agencies was insufficient-- whether more regulation was needed or whether existing regs should have been observed more closely. And govt policies proved subsequently to encourage the "moral hazard problem" through bailouts-- that failure would be bailed out will encourage more risky behavior. 3.) The key to the story is "imperfect information"-- in particular, information that was highly imperfect and worse yet, highly asymmetric. In the face of such information asymmetries, markets have some remedies and govt regulation can, at least in theory, provide a defense. Think of buying gasoline. How do you know how much gas you received? The little numbers say 9.3 gallons, but how do you know? The gas station has a reputation to uphold and some investigative journalism from a local TV station could bring down the company. But what sort of defense is this, really? Modest. The govt promises to help and hires inspectors to monitor this and affix stickers to the pumps, certifying their approval. But what does this promise? Do we faith in the sticker-placer and do we ignore the firm's post-sticker incentive to cheat and actually take advantage of our faith in the sticker? In the case of investments, investors rely on credible/objective ratings agencies to step into this information breach. From Lewis' work, it seems clear that the agencies were mostly confused-- but in some cases, unwilling to pay the price for negative assessments of these instruments. Consider "house inspectors" as a parallel example. What makes for a "good" house inspector? Finding all the significant faults in the quality of a house, right? But that's only from the perspective of the buyer. From the perspective of the seller, a good inspector would turn a blind eye to less obvious faults. And more troubling, a realtor has similar incentives. What makes a good ratings agency? It depends on your perspective. And in this case, they failed to provide accurate, objective information. Lewis argues that the ratings agencies failed, in terms of competence (vs. motives), given the complexity of investment vehicle, by mistaking diversity for lower risk. Often, diversity lowers overall risk by spreading risk. But in the case of the mortgage-based securities, there was a bundling of diverse, but still highly risky loans (within the subprime housing market). Moreover, the agencies and the market participants who guessed incorrectly failed because their statistical models, based on historical data, assumed housing prices that would increase forever. All of this points to "market failure" (the academic term)-- or "market struggle" (to choose a more accurate term). But as always, market struggle must be contrasted with government failure/struggle. Will govt agents be able to regulate something they cannot understand either? The general public's reflex-- and for Congress as well-- is to seek more regulation. But as in many other cases, the record is that existing regs were not embraced to anything near their full extent. (Lewis discusses these failures in passing-- most notably on p. 166.) It is then an act of faith to believe that govt regs will improve things. Perhaps-- but perhaps not-- especially with the reality of interest group politics. Employees may not realize it, but they are getting more expensive. Americans, in fact, sense this already. "People are worried about income security to an unprecedented degree," says Moody's Analytics economist John Lonski. Indeed, the share of those expecting their income to fall remains higher than the share expecting income to rise over the next six months, as per the Conference Board's October confidence survey. This situation never occurred in the survey's 30-year history prior to 2008. Now, it has become the norm. 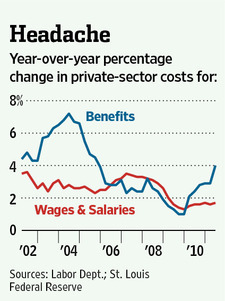 Low wages at least could spur hiring. But if employees are getting more expensive for other reasons, the risk is nobody benefits. The Franklin Township school district in suburban Indianapolis angered thousands of parents a few months ago when it contracted with a partner that’s now charging families what will amount to more than $400 per child this school year for bus service. And lean times could force other districts in similar straits to take a hard look at bus service. Indiana’s attorney general is poised to issue an opinion on the legality of Franklin Township’s move. District Superintendent Walter Bourke said a decision against Franklin Township could force the district to eliminate transportation entirely. But he expects legislators next year to consider a law that would require school districts to transport students — a law he said could force struggling districts into bankruptcy if it passes. Both adoptions were trans-racial and semi-open through a private agency, Childplace. We received good training through them and the state of Kentucky. We talked to adoptive parents; we listened to panel discussions; we read the literature; we got involved in a trans-racial adoption support group; and so on. We didn't get to meet Z's birth-parents initially. I was at a conference, scheduled to hear Margaret Thatcher speak that evening (! ), when the call came. They were willing to meet us that day, but despite me rushing home, they found it too difficult to hang around and meet us the next day. We did get to meet J's birthparents at the agency-- after she had given birth and he had been placed in the foster home, as we awaited the court's work to be done. That was an amazing experience! Once we had our children, like most adoptive parents, we were leery to have direct contact with the birth-parents. (I think we were less leery than average, but still not fully at ease with it.) We wanted photos and cards/letters from them, through the agency. But meeting them, with our son, was somewhere between exciting, mysterious, worrisome, cool, and weird. If the occasion had arisen, we would have done it, but not without some fears and worries. Once the boys got older, we started to realize that we didn't have anything (significant) to worry about. When your kid is X years old, it would scare the tar for him/her to think of living with people, who to him, are complete strangers. And we heard stories from friends who had open adoptions and glowed about the opportunity to meet the birth parents. We grew more and more interested in meeting with them. Unfortunately, but understandably, we weren't getting much contact from the birth-parents through the agency. (I can't imagine how tough it would be, in their position.) We received a letter or two and some photos from J's birth-parents. But Z's birth-parents had a rough life and went underground (from the agency's perspective) when he was a year old. All of the letters and photos we had sent to them remained in a file at the agency. Making things more challenging, it seemed likely to us that J's birth-father (and perhaps his birth-mother) would be willing to meet-- if we asked for that. But this would have been really tough on Z, who is about 4.5 years older and far-darker-skinned, and thus, has wrestled much more with adoption. So, we laid back-- waiting, hoping, and praying that Z's birth-parents would emerge. In March 2010, the agency found Z's birth-mother on Facebook! The case worker asked whether she was interested in receiving the pictures and letters from the last decade. She said yes. Then, she wrote us! Very exciting-- for us and for Z. We would exchange letters every few months-- us writing soon after receiving her letters, and then her, after some weeks. We were angling to meet her, but it seemed like we were treading water. Finally, we pushed by giving specific dates-- and after another long wait, she agreed. In the meantime, we had an exceedingly rough year with Z. His behavior at home was really difficult: punching holes in walls, intimidating my wife, scaring the other boys, and so on. It got to the point where I would not leave him alone with my wife and other kids. His grades were not good; he would occasionally refuse to go to school; and so on. It was UGLY! So, here's the wild thing. When we finally met her in May 2011 at a McD's, Z was immediately and completely of a different heart. He apparently felt tremendous peace and resolution. Looking back, we hadn't caught that his gradually increasing agitation and behavioral problems seemed to stem from having contact with her, but not having yet met her. While he still had/has some bad habits to work through-- in terms of how to respond to frustration-- it was like night and day. Crazy! After a second visit with her, we then moved to ask for a meeting with J's birth-father. In the same time period, he had found me on Facebook and we exchanged more messages and pictures. We met him with J-- again at a McD's-- and it was excellent. -If you haven't already, continue to talk openly with your kids about adoption. -If you haven't already, read some of the literature on adoption, the sense of loss and gain for the child, etc. -Pray for wisdom and courage. Ask others to join you. -Be open to meeting the birth-parents.Consider that your adoptive child will probably want to meet his/her birth-parents. Do you want to do that with him/her now, when they're a little older-- or do you want them to do it by themselves when they're 18-22? What signals does it send if you don't aim to do it if you can? -Continue to persistently love your children-- no matter what they feel, what they claim to feel, what they say, what they do.